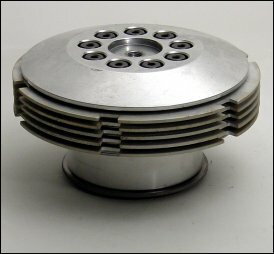 Our Competitor Clutch Kit (part # CC-100-S) Is for Knuckleheads 1936-1947, Panheads 1948-1964 and Shovelheads 1970-1983. This kit features (9) coil springs and (9) shoulder bolts. You may run (6) or (9) springs and bolts depending upon your needs for pressure plate adjustment, less springs less clutch pack pressure and less clutch lever pull. Run all (9) to maximize your clutch pack pressure and clutch lever pull. Our large double row hub bearing provides maximum performance and strength and secures the clutch basket and clutch hub together for that “non-floating” basket, which will give you a smoother clutch operation and positive clutch adjustment. The polished aluminum pressure plate tops off that custom look for the open belt drive installations. Our race-proven Kevlar clutch plates make the Competitor Clutch light years ahead of the competition and a must have for your early American V-Twin. Simply press the CC-100-S into your OEM basket or one of BDLs early clutch baskets.